Kirk. Solo. Reynolds. All famous starship captains, and now your name can be added to the list! 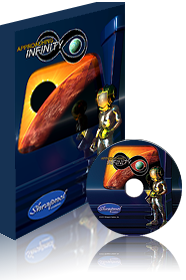 Approaching Infinity is a science fiction rogue-like game of infinite intergalactic exploration and adventure. It is a game of stellar exploration, planetary investigation, starship battles, diplomacy, crafting, commodity trading, and much, much more, all set in a totally procedurally generated infinite universe. In layman's terms this means that with each game an entirely new universe is created, allowing for unlimited replayability. While rogue-like games are not true role-playing games they do focus on a player generated character, and in Approaching Infinity that character is the starship captain and his (or her) starship. Each starship has its initial strengths and weaknesses, but are upgradable with new and superior components as the captain's career unfolds. Of course no captain ever got to where they were without their Scotty to squeeze out a few more warp factors or Jayne to control planetside disagreements. As the game progresses officers with special skills can join your crew, each contributing to the successes of your adventures. And if they're not contributing there are ways to deal with a bad crew, from firing to letting them lead an away team on a lava world polluted with poison gas and hostile critters. Approaching Infinity allows the universe to be your sandbox. Explorer, pirate, mercenary, trader, or perhaps a mixture, the where and why of your adventures is entirely up to the player. There are multiple victory conditions that allow a hard win, but there is also simply the sense of satisfaction of your own five year trek across the stars. Create your own self-imposed quests or discover the 140+ custom quests. And in Approaching Infinity the stars truly are infinite: there are no level caps, no limit to the number of maps. To keep it challenging though the further you go the more dangerous the encounters. Approaching Infinity's universe is not only vast but it is filled with excitement. Discover the wonders of space, from new planets to nebula to radiation belts. Encounter twelve alien races, each with their own agendas and quests. Become a trader and buy low and sell high. Send Away Teams on missions, both planetside and amongst space wrecks adrift in the cosmos. See new worlds and kill new life forms. Battle monsters, alien spacecraft, and even disease. Mine asteroids, loot ancient star temples for mysterious artifacts, and craft new items from the assembly of old items. Gameplay is highly approachable, with Approaching Infinity taking on the tropes of what makes a "classic" rogue-like game while infusing the game with a modern, player focused commitment. Beautiful retro-visuals provided by David Gervais (known for his various rogue-like tilesets, along with other science-fiction titles), and immersive music by Nathan Becker aka 'ectogemia', transport players into Approaching Infinity's realm. Control can be mouse or keyboard. An intelligent interaction system allows players to focus on gameplay and not a multitude of commands. Approaching Infinity's nods to classic rogue-like play includes permadeath, procedurally generated environments (with over thirty different generation algorithms), random creatures, items, and quests. Artifacts must be identified and there is a ticking oxygen clock for away missions. Yet, thanks to the ability to turn permadeath off, the ease of play, helpful tooltips, and more, this is a player's rogue-like game; a game of endless adventure, a game of 'one more turn'. Ultimately, Approaching Infinity is about your story amongst the inky darkness of a bejeweled galaxy. Tell it the way you want it told. Be the gruff but lovable space pirate, the alpha leader who personally puts him or herself in danger, the wide eyed explorer who simply wants to absorb the beauty of creation. And when that story is over, start it all over and discover a brand new universe. Approaching Infinity, the absolute joy of sci-fi adventure on your computer. - Single-player, addictive turn based rogue-like gameplay in a unique sci-fi universe. "I promise, one more turn and I'm coming to bed, hon..." Oh, you liar, you. - Available for both Windows and Mac. - Designed for both casual and experienced players of the rogue-like genre. Tool tips, contextual commands, tutorial, and a sensible UI all help to make Approaching Infinity highly accessible. - Permadeath (one life per game) is optional. - Procedurally generated environments. Explore planets, derelict vessels, temples, space stations, ruined cities, and alien embassies. - Enjoy both randomly generated and hand crafted quests, along with various victory conditions of differing difficulties. - Truly infinite play! No level caps, no end to the maps. Play forever. - Encounter over 70+ devices, 50+ skills, 98+ effects, and 99+ monsters. - Hire officers that can level up and acquire new skills. - Create Away Teams, but be warned, if the captain goes down and dies a horrible (or even a pleasant) death, it's game over. The captain can't always sit it out in his chair though, as sometimes only the captain can solve the encounter. - A nifty "pay it forward" mechanic. Spend current game currency to invest in future games! - Full modding support, including a separate modding manual. Violate intellectual property laws with new visuals, names, quests, and more, no coding needed. - Robust achievement system! Earn achievements that give real rewards in the form of additional "pay it forward" credits. Available only in permadeath and non-modded modes. - Games should be fun and Approaching Infinity has a wry sense of humor, along with plenty of references to your favorite sci-fi properties. - Infinite stories, infinite enjoyment.